Whew. The Church Event is Done. Not. 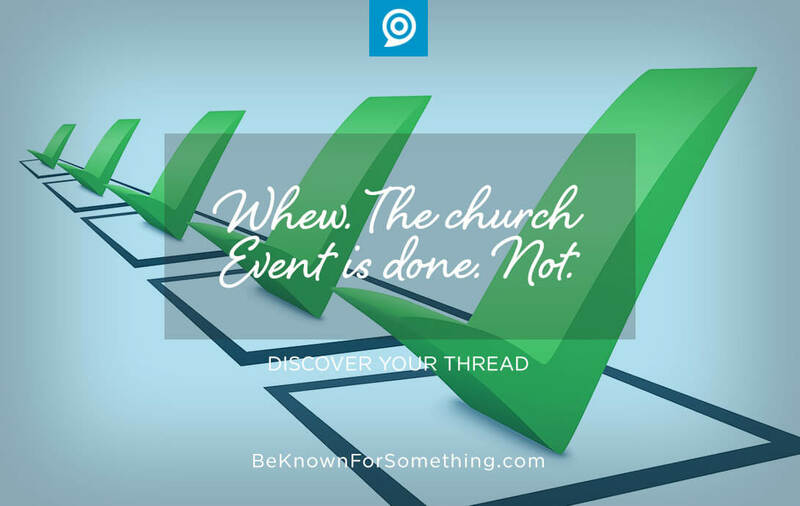 Be Known for Something : Discover Your Church Communication Thread / Communications / Whew. The Church Event is Done. Not. Throughout my life, I’ve been involved in church events. Either planning, writing, acting, singing or promoting large (and small) church activities. Although, as a church communicator, we spend most of our time before events —in preparation and promotion. Then, what seems like seconds before the event, you are overcome with relief as you realize your part is done. Deadlines are completed and you accomplished everything that was demanded of you and your team. Well, everything that could be done within your limitations (time, talent, budget). You’ve spent time visualizing what the event should look like. There’s a flurry of activity as you supply the promotional needs. And now it’s done. You breathe a huge sigh of relief. Whew. The event is done…Think again. Attend the event. You want to be invited around the leadership table. The best way to accomplish that is to attend the top tier ministry events (or all events if possible). Your participation or attendance helps when you make suggestions at the next planning meeting. You’ll also be seen as co-laborer in the ministry. They know you want them to succeed and not just building your own ministry silo. 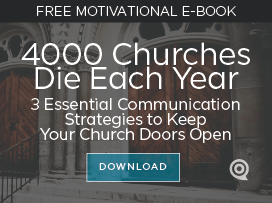 Ultimately you become the connector of all the ministries since very few other church leaders attend “all” the events. Want to go a step further? Ask how you can help volunteer at the event to help. Watch through the eyes of the leader. You’ve heard and understood the leadership of the ministry. You’ve encouraged the big dream and fanned the flame of their ministry. Now watch it play out through their eyes. Watch them and see what feeds them or what emotionally drains them. The more you understand, the more you can anticipate their heart. Have a followup meeting. This is the toughest, yet most important, time for the ministry. Plan a meeting with the event’s stakeholders as soon after as reasonable. Discuss the event, goals, and outcomes openly. Advocate for the audience; truly listen to the leadership. Take responsibility for anything that was dropped on your part. Celebrate every victory (especially for others). Write down how things need to change for the next event and essentials that need to happen communication-wise in the future. Now you’re done. Just in time to start the next project. Your job is never done — properly orchestrated, the communication leadership has one of the biggest jobs in the church. Uniting all the ministries and communicating the benefits of participating. You’re a huge resource.